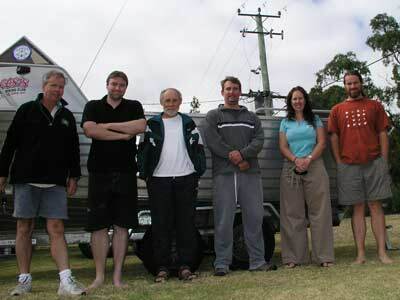 Today we are diving with the Tasmanian Scuba Diving Club from Hobart. We have to meet them at Sisters Beach at 8 am so we are up at 6:30 am and are gone by 7:07 am. We drive the almost 60 kilometres to Sisters Beach and just before 8:00 am we meet James Parkinson, the President of the dive club, and go to the accommodation they are using. We meet the other divers on the trip, Andrew, Brendan, Stephen and Bruno (funny thing is that we run into Bruno in September at Kavieng in New Ireland, Papua New Guinea!). We do a couple of dives today out of the club's very nice boat. The first one is at North East Sisters Island (click here to read about it) and after lunch back at the house, we do a second dive in the afternoon at Simos Reef which is off Sisters Point. Tonight we stay at the Beach Houses. This is a very nice series of houses, but they are not on the beach and a little expensive at $60 per person per night. We have a barbecue with the others and they cook up a crayfish which they caught. Today we are again diving. We are doing the second dive of the day (the others except for James will dive first) and we have to meet them at the boat ramp at Rocky Cape. We leave at 8:45 am and drive back to the highway and then west to the turnoff to Rocky Cape. It is a 30 minute drive. This is a very beautiful spot, again with crystal clear blue water. However, there are swarms of flies that even this early are making it uncomfortable. We do more dives, this time at Rocky Cape Outer Reef and after lunch, at North West Rocky Cape. After the diving we go to Wynyard as we need to get some more food, beer, wine and fuel. After this we return to Sisters Beach. We have another barbecue and go to bed at 9:30 pm (diving is tiring). Although today we have a lot of kilometres to do, it is all on good roads so it will not take us too long. We head south out of Wynyard towards Queenstown but take a different route to the one we took back in May 2006 when we were last here. We end up back on the Murchison Highway. As I mentioned before, we have travelled this road before when we were here in 2006 but in the opposite direction. 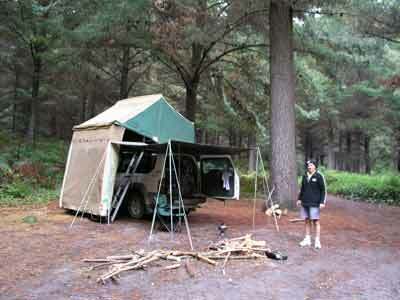 We were going to stop for morning tea at Hellyer Gorge which has a small camping area. There is not much else here, I remember that I was a little disappointed when I first visited here, I thought that as it was a state reserve it would have a few more features like walks. Anyway, there are a lot of campervans here so we keep going and just after the Waratah turn off (which we took five days ago), at 10:40 am we stop at the Fossey River Rest Area. This is excellent, with a grassy area, tables, toilets and enclosed shelter area. We have morning tea here and leave at 11:08 am. It is still quite cool, 13ºC, but sunny. As we are on a highway, the travelling is good and we soon cross over our previous track as we have already passed the turn-off to Savage River and soon the one to Cradle Mountain. We have gradually climbed all day (apart from the drop to Hellyer Gorge) and the altitude is about 800 metres as we begin the drop down to Tullah which is on Lake Rosebery and Lake Mackintosh. The height here is just under 200 metres. The view from the road as you drop into Tullah and the move onto Rosebery is spectacular in parts. On either side of the road there are mountains that tower over the surrounding land. There is Mount Farrett at 714 metres behind Tullah, Mount Murchison at 1275 metres ahead and behind Rosebery, Mount Black at 950 metres. Just before Tullah we go out to Lake Macintosh and find a couple of okay camping sites. Back in the town there is a very interesting display of mining machinery and opposite this, the Wee Georgie Wood Steam Train. As it is a Monday the train is not operating but the train shed is open as one of the volunteers is cleaning the firebox. The train was originally use to car ore from one of the local mines and now runs a few kilometres as a tourist attraction. 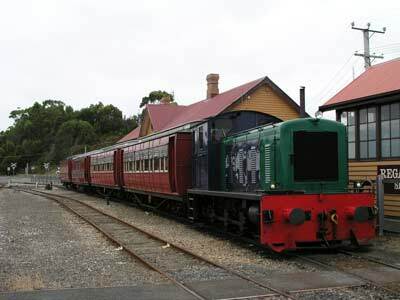 As a matter of fact, there are a lot of trains like this in Tasmania, I have seen at least four such operations. Anyway, we have a look at the train before heading off to Rosebery. As we leave town we see what looks like a ski lift crossing the road. It turns out to be an aerial skyway that trasnported ore from a mine to Tullah. The section across the road is all that is left. It is identical to a ski chair lift except it carries ore in small buckets. We arrive at Rosebery at 12:45pm. 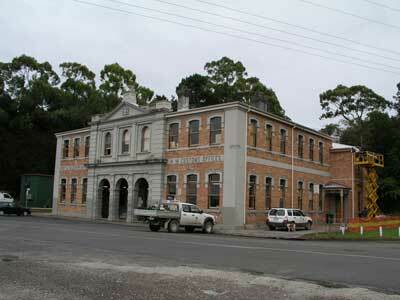 This is a mining town, with one pub, an RSL, bank, hardware, newsagent, pizza place and cafe. I buy the paper and a Lotto (there is a draw for $21 million on Saturday) and we leave at 1 pm. After the town of Roseberry, the highway follows the southern edge of Lake Pieman before heading south to the intersection with the Zeehan Highway. 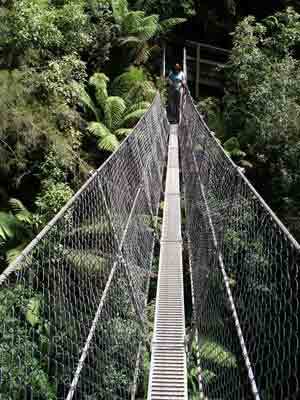 However, we are taking a diversion to Montezuma Falls. This will involve some difficult four wheel driving, the only bit of the trip. We miss the turn off as it is not sign-posted and we cross the Ring River before I realise we have missed it. We backtrack and take what we assume is the track. The track is about 300 metres before the river, with the remains of a signpost on the left side of the road (as you come from Rosebery). This is quite a hard track, with a bit of low range required and an easy crossing of the Ring River (1:30 pm). 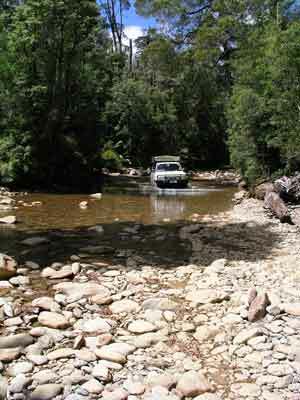 You actually have to drive about 50 metres down the river to get to the other side. From the river is very hard as you climb up. We eventually come to the other track that leads in off the highway from the south. This follows the tramway line. As such, it is a much gentler slope, with lots of cuttings and embankments. 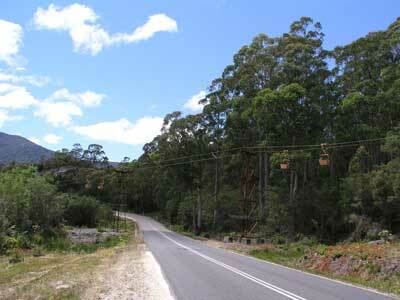 The tramway is the North East Dundas Tramway that ran from Zeehan to Deep Lead (now Williamsford). 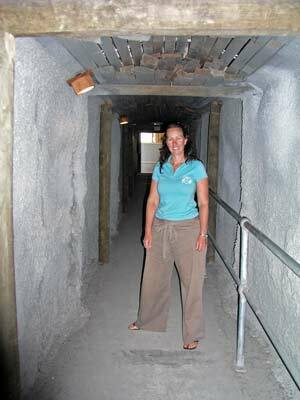 This was constructed to access mining sites in the Mt. Dundas and Mt. Read areas and to take it to Zeehan. There are even sleepers still on the track. It is pretty easy except for a couple of creek crossings. Originally there were timber bridges across the creek but they have collapsed (one can still be seen) and the four wheel drive track goes down and around the creek to cross. We arrive at the end of the track at the car park at 2:15 pm. It has taken us 59 minutes to travel the 10.2 kilometres from the highway. 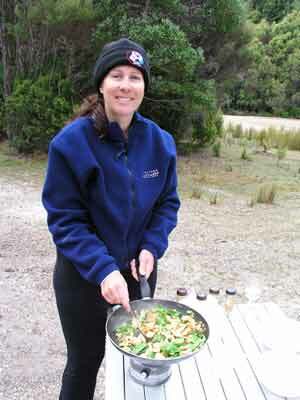 We make lunch before setting off on the short 200 metre walk to the falls. There is a rope suspension bridge across the creek and this gives the best views of the Montezuma Falls They used to be called Osbourne Falls back in the 1800s before the mining company called Montezuma Silver Mining Company began mining in the area. There is not a lot of water coming down, but it is worth the effort. 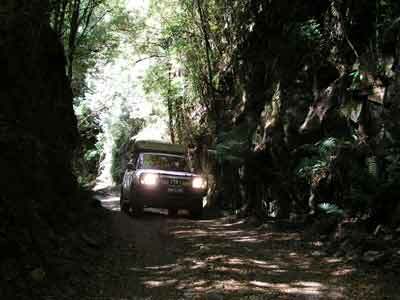 We head back out along the old tramway, encountering quite a few cars coming in from Zeehan. Once back on the highway we head to Zeehan, our stop for the night. 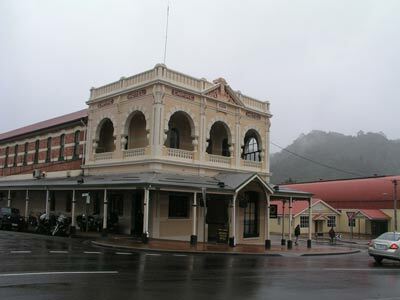 Zeehan is another of those magnificent old Tasmanian mining towns, with a main street that harks back to the late 1800s and early 1900s. 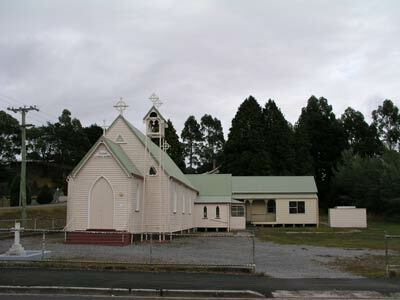 We get there at 3:40 pm and go to the Zeehan Museum. This is a very large museum, with sections on all the mining towns nearby, agriculture and more. Outside there are some steam trains and mining machinery and even a fake mine. It even includes the spectacular old theatre and the Police Station/Court House. Well worth visiting, I am just a bit disappointed that we did not have more time to examine everything. After the museum, we go to the Central Hotel and have a beer. Not a lot of character inside this pub. 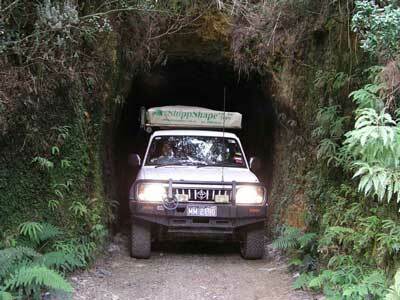 Before setting up camp, we decide to go to the Zeehan Spray Tunnel. This is another relic of the mining period when a narrow track railroad ran through the hill. It was built in 1901 by the British Zeehan Silver Mining Company when extending the Argent tramway to the new Spray mine. Today one car can drive through its 200 metre long length. Well worth doing for the experience. 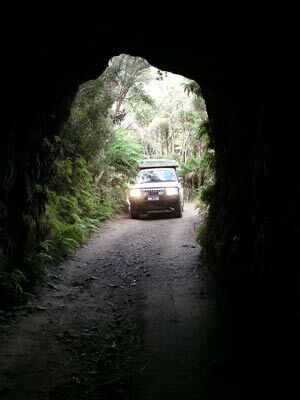 It is very much like the tunnel you drive to when travelling to the Glow Worm Tunnel in the Blue Mountains west of Sydney. At the end of the tunnel there are the ruins from the Spray mine. We stop and have a look. We head back into town and go to the Treasure Island Tourist Park (what a stupid name for a caravan park in this part of the world). Anyway, we find it very crowded so we decide that we will camp at a spot we noticed at the mine site at the end of the Spray Tunnel. We go to the other pub in town, the Cecil Hotel, and have a beer. This is a much nicer pub. 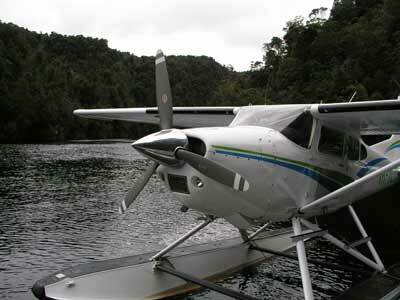 Today I also phoned Strahan Seaplanes to double check that our flight tomorrow morning is still on. It is. We drive back out to the Spray Tunnel and at 6:10 pm we set up camp. Kelly cooks chicken with cashews and rice. However, when cooking the rice, we have a problem as the handle of the saucepan falls off. It was a cheap saucepan, but it has lasted almost nine years and travelled some very rough roads. It is not repairable. After dinner, a couple of cars come through the tunnel and look around the mine site. It drizzles a bit overnight. 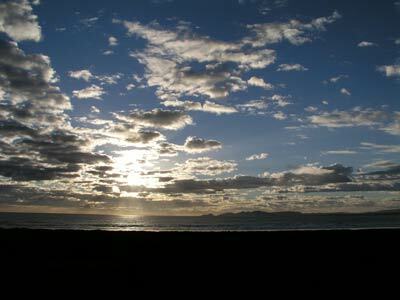 Today we only have a short distance to drive, 83 kilometres to Strahan. We are due to do our flight at 10:00 am so we need to be at the wharf about 30 minutes before. We are up at 7:20 am (11ºC) and leave by 8:10 am (probably the quickest of the trip). We drive to Strahan, stopping at the lookout just out of town. This gives a good view. We arrive in town at 9:05 am. We book in at the seaplane company on the waterfront. We have to be back at 9:30 am so we go for a walk through the town. There is a huge pub, some shops and restaurants and some small timber cottages at the end of the mains street. There is also a toilet block here and I discover that it has free hot showers. This may come in handy I think. We go back to the waterfront and book in. The cost of the flight is $179 each. This is if there are four on the flight. As we were not prepared to pay more, we had told the company that we would only fly if the cost is $179 each. Luckily, they have got another couple for the flight. It is a short walk to the plane which we see land after another flight. I get the front seat and Kelly the back one, with the couple in the middle. We take off at 9:50 am, a little ahead of schedule. The flight is amazing. 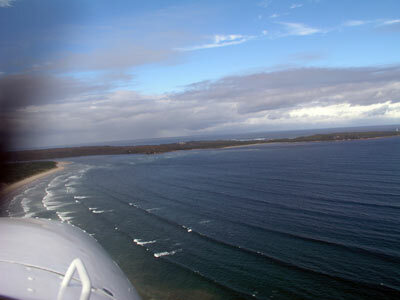 We take off and fly out over Ocean Beach and onto Hells Gate, the entrance to the huge Macquarie Harbour. It got its name from the female convicts sent to Sarah Island, the entrance was the gate into hell. We then follow the western side of the harbour to Sarah Island. 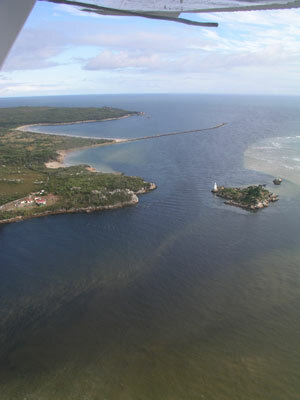 There are quite a few fish farms visible as we near Sarah Island (a female convict peneteniary). 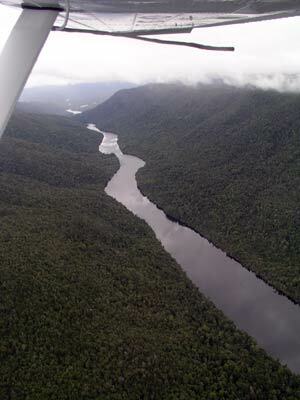 We go over the end of the Gordon River before crossing over the hills to the famous Franklin River near Mt McCall. The Gordon is millpond, like a mirror. 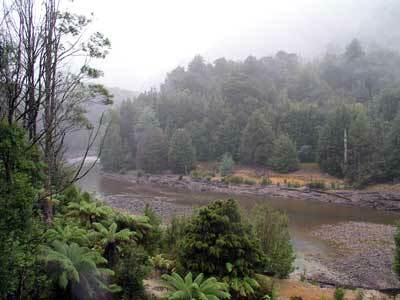 We then follow the Franklin River downstream. It has lots of rapids and we see a group of people in some rafts. 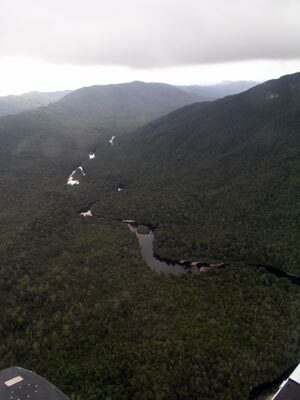 We continue to the Gordon River and turn right, heading downstream. 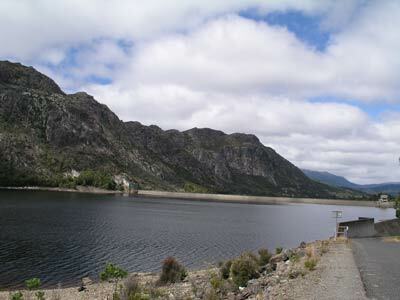 This is where the dam wall was to be constructed (the Gordon Below Franklin Dam). We land at Pines Landing. 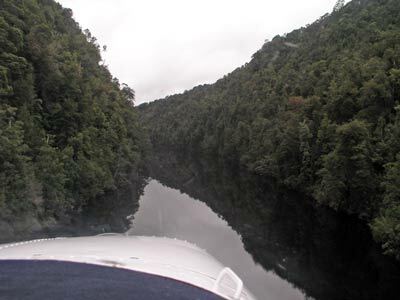 The approach to the landing spot is brilliant, we drop down into the valley and skim the river before touching down. We motor along at about 60 kilometres per hour till we get to the landing. This was the location of a lot of protests back in the 1980s against the damming of the river. Luckily, the dam never proceeded. 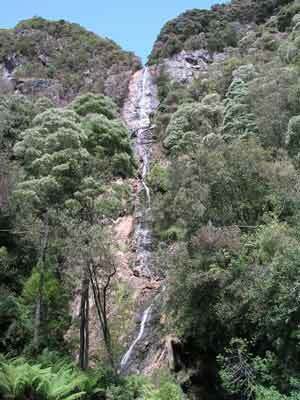 While here we go for a short walk to St John Falls. 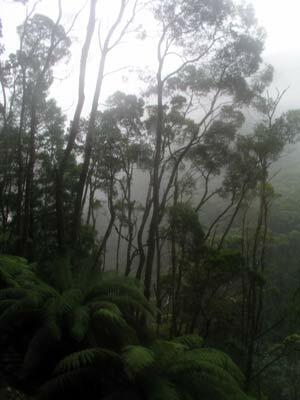 This is simply beautiful rainforest, with everything covered in a heavy layer of moss. 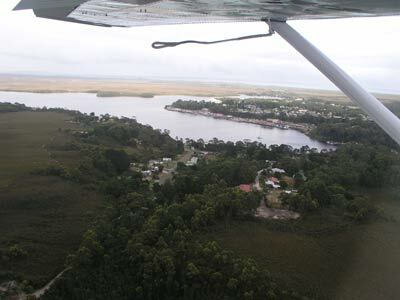 After taking off we travel back over the eastern side of the harbour to Strahan. The whole trip takes 80 minutes and cost $179. I have done many low level helicopter flights as part of my work (fighting bushfires and other things) but this would have to rate as the number one flight I have ever done, even better than my scenic flight over Uluru and The Olgas in the Northern Territory in 2003. If you can afford it, I recommend it as an alternative to the boat cruise which only goes part of the way up the Gordon River. As we approach Strahan, it starts drizzling and after we land, we walk to the nearby shops that sell timber. We purchase a piece of Huon pine for $27 which we plan to make into a chopping board for our new house. We also look in a couple of other shops before going to a working saw mill right on the waterfront. Here we look for a piece of Huon pine large enough to make a coffee table but we cannot find a suitable size. We also purchase a cross-section of a small Huon pine branch or tree that I plan to make into a teapot coaster. It was only $5. It is now raining a bit heavier so we decide to go for a drive out to the train station at Regatta Point to book on for tomorrow. 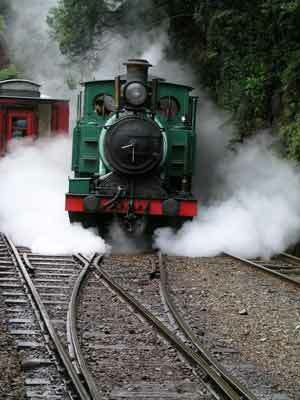 This is the historic train that runs from Strahan to Queenstown and visa versa. Read tomorrow's report for more information. We book on at $119 each. We go to a park on the waterfront to eat lunch but it is freezing cold (12ºC and very windy) and Kelly ends up in the car while I hide behind a building. We have to buy some food so we go to the supermarket and get a few things. I also need to get a new saucepan but neither the supermarket or a homewares shop has a suitable saucepan (that is, one that is big enough but will also fit in the spot in the car that is available for it). We decide to go and look at the two caravan parks (I had only found one on the internet) and we decide that we do not like either, both are too crowded, too open and lack any sort of charm. We decide to go out to Ocean Beach to look for a camp site. This is not far out of town, past the airport. We go to the beach where the seas are now quite rough. On the way back towards town we go down each track that we see, but we find no spots that are protected from the wind, flat and nice. We find a couple that we could use in a pinch, but we decide against stopping here now. We then drive out to Macquarie Heads. The turn-off is right at the airport. At the heads is Hells Gate. This is the entrance to Macquarie Harbour. I am not sure how it got its name, perhaps the convicts or soldiers thought that it was like entering Hell when they passed through on their ship. On the way there we come to Swan Basin State Forest. This is a pine forest and we see a car camped at the start of a fire trail (not sure how they think anyone wanting to use it is going to get past them). A bit further on we see a few tracks going off into a more open section of forest. We go down one and find a very large area without any undergrowth. There are a number of people camping here. This looks good we think. We exit back onto the road and continue out towards Macquarie Heads. We come to the camping area which is just before the end of the road. 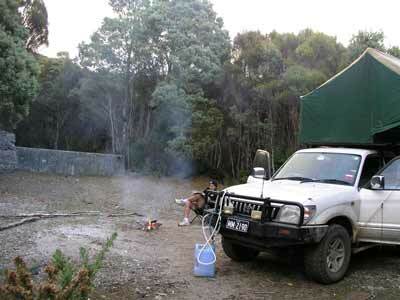 Well, this would have to be one of the worst camping areas I have ever seen. Not flat, no protection from the prevailing south-westerly winds and more. There are also some huts here. There are lots of fishers and we straight away decide that this is not for us. 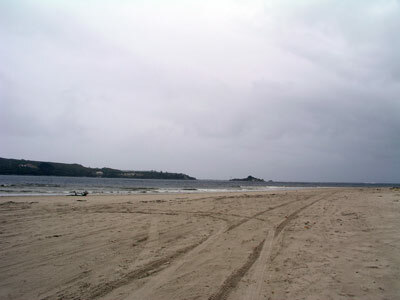 We go right to the end of the camping area and drive onto the beach. We go a few hundred metres on the hard packed sand below high tide level. I stop to take a few photographs. When I get back in the car, nothing happens when I try to start the engine. This is a worry, the battery is a few years old now and today, car batteries seem to just die and give no warning unlike years ago when you would know your battery was failing. What is the tide doing I think? No idea! Well, I better do something. I open the bonnet and check the battery. The first thing I notice is that the bracket that holds the battery in place is very loose. I then notice that one of the connecting arms is missing. I try the terminals and find the positive one is very loose. I tighten it up and the engine starts. Glad that this was the problem. I immediately suspect that the very rough track we did yesterday to Montezuma Falls has loosened the nuts causing the battery bracket to come free and then the free movement has loosened the positive terminal. I find the bracket arm but not the nut. We head back to the state forest and the spot that we have chosen is still vacant. We put some chairs and the tarp here to keep the spot for us as we need to go and get some fire wood. We go a little way down the main road to the Old Lighthouse Road. We head down this a kilometre or so and find some nice pine trees that are quite dead. I chop one into good sized pieces while Kelly collects some smaller bits. We head back to the camp site and set up camp. It is now about 3 pm so I start the fire. We need to warm up a bit. This is a very nice spot and soon a bloke walks by. A little later his wife comes looking for him and we have a chat. They are Gary and Sue from Sydney. We later on go over and have a couple of drinks with them. Some other people turn up during the afternoon and one is a VW van with a pop-up top. We will later meet them at Bruny Island and see them again a few more times as we head up the east coast. 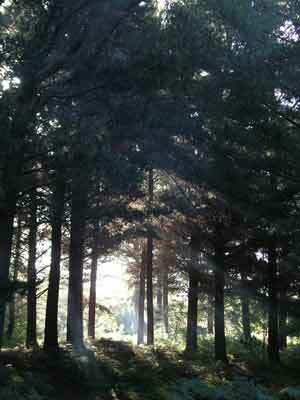 It is pretty protected under the pine trees and there is little wind and not much rain gets down to us. Tonight we have a barbecue. Today we are doing the train trip from Strahan to Queenstown so we have another relaxing start to the day. At 8:40 am we head into town and go to the toilet block on the waterfront. It is only a 20 minute drive. Here we have a hot shower. Feels great after the wet and cold day of yesterday. Today the weather is not much better, maybe even worse. After the shower, we drive the short distance to Regatta Point where the train departs. There are actually two trains that do the trip, one from each direction. They depart Queenstown at 10 am and Strahan at 10:15 am. Each train travels approximately half the distance between the towns to a station called Dubbil Barril (surely a misspelling of double barrel - not an Aboriginal word as claimed on the train). Here you swap trains and take the other train as it heads back to its home town. This is because one of the trains is a rack railway, using rack and pinion to climb the steep hills into Queenstown. Anyway, we park the car and get our tickets from the station (the woman had problems yesterday printing them out) and find our allocated seats on the train. The train is about 60% full but we are lucky to have no-one opposite us. At 10:15 am the train heads off. 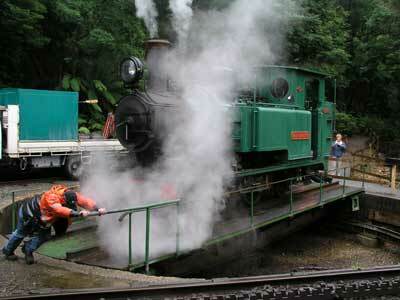 It is an old mining diesel engine pulling three carriages of passengers and a kitchen car. 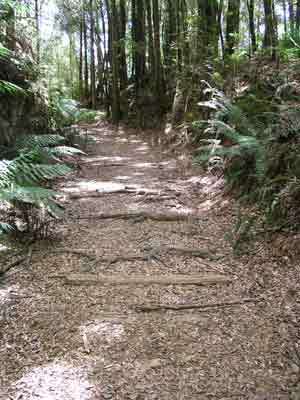 At first the track runs adjacent to the old line as this was converted into a road when the original line closed down. 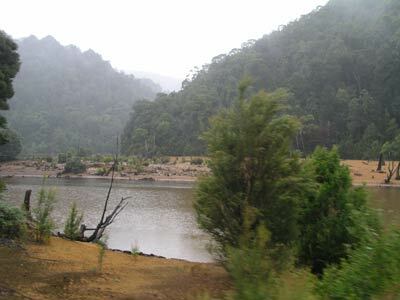 The train goes past the spot where the King River enters Macquarie Harbour. I had noticed this the day before from the air. Here there is a huge delta of silt that comes from the tailings from the mines at Queenstown. It extends over a huge area. 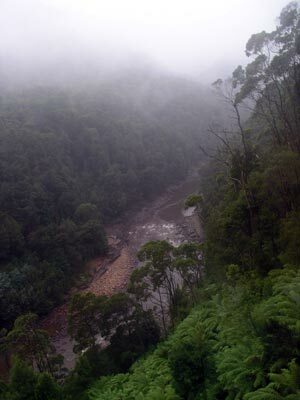 The King River is a dead river. It is coloured yellow from the tailings, even decades after the mining practices improved. Apparently no fish live in it at all. All along the banks there are spots where tailings have been deposited. Little grows in these spots. 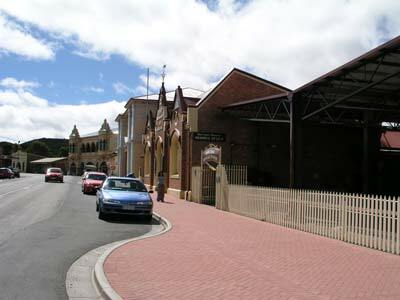 The railway was restored using Australian Government funds in the early 2000s. Money well worth spending I reckon. We stop at Lower Landing where morning tea is available from the kitchen car. We have brought morning tea in a thermos with us so we have a cuppa here. It is raining heavily but I go for a walk (I brought my rain jacket, guess who didn't?). After a 30 minute stop we are back underway. As we travel, a guide gives a talk over the loudspeakers. It is very informative, although I felt it was a bit too much and there could have been less talking. We certainly learn a lot about the railway, the river, the environment and Queenstown. 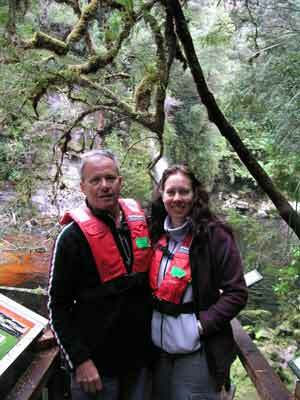 There are some huge trees as you go up the river and the rainforest is certainly spectacular. When we arrive at Dubbil Barril the other train is already here. Not only is this is a steam engine, it is a very unique train. 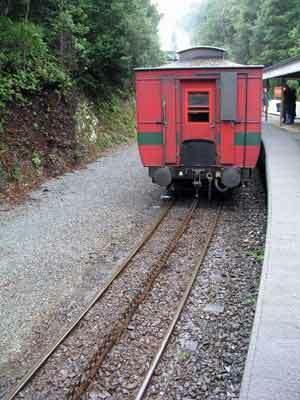 It is a rack railway. The train line from here to Queenstown was so steep in spots a normal train would not be able to climb up or down these sections. A normal train can climb a 1 in 40 grade (2.5% - that is, for every 40 metres it goes forward, it can climb 1 metre). 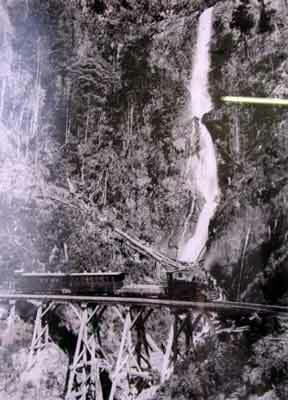 The train from Dubbil Barril to Queenstown has 1 in 15 grades (6.6%). It was decided to make it a rack railway. This means that there is a separate third rail or track on the steep sections. This sort of looks like this: WWWW. 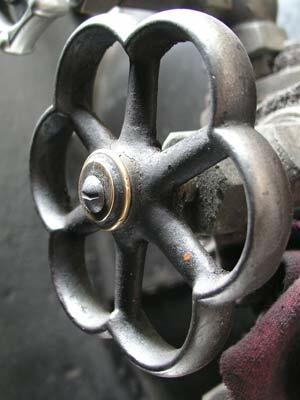 Under the steam engine there are two cogs that drop down on command and slot into the rail. These are also WWWW shaped. Then the power is transmitted through the cog wheels that pull the train up the steep sections (and provide the braking when descending). Soon after arrival, the engines unhook from the carriages and taking turns, go to the turntable on the Queenstown end of the station. Here each engine is turned around and then reconnected to the other end of its set of carriages. We climb aboard our new train and find that we have different seats allocated to us. We put our bag on the seat and go back outside. I notice that there are some other things on the seat but I do not worry about this. We get our food pack from the kitchen car. This is made up of a dinner roll with ham, pastie, camembert cheese and crackers and chocolate truffles. It is quite good. We have also brought along some cans of soft drink and we have lunch under one of the many shelters (it is still drizzling). After lunch, we get back on the train and find that a couple and their son are sitting in our seat. When I point this out to them, they claim that this is the seat they were sitting in before. I point out that nobody is sitting in the same seat, we have all been moved to different seats. They refuse to move, claiming "we are settled in and it will upset our son to move". Someone else on the train points out their names on other seats but they still refuse to move. I cannot bother arguing so I gather our gear and take their seats. Talk about selfish people! 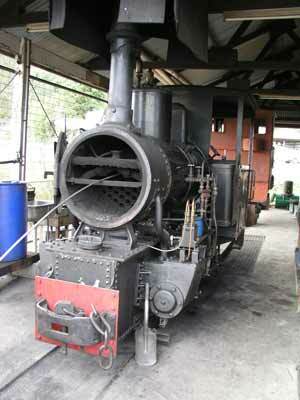 Anyway, soon the steam engine is off. It is a steep climb out of Dubbil Barril station as the cogs system takes over (this is called Abt, after the person who invented it, a Swiss man called Mr Abt). I can see why it required a rack railway, it is very steep. The scenery is also quite spectacular as we go along. It is a shorter distance to Queenstown but the train is much slower. 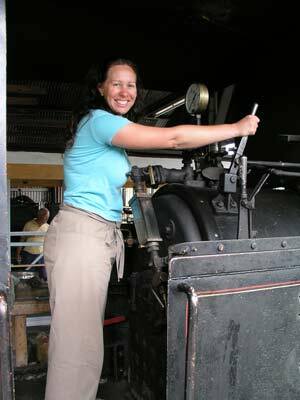 It is a great experience being on a steam train, especially one that is so unique. There are some spectacular sassafras trees here, 55 metres high apparently. 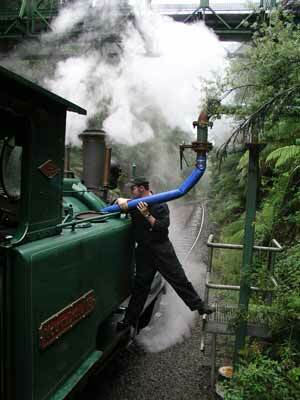 We stopped at the next station where water was added to the steam engine and the climb up has used all the water. It is all downhill from here to Queenstown. We arrive in Queenstown at 2:15 pm and at 3 pm a bus will take us back to Strahan. We walk around town and I check out a couple of places for a saucepan without luck. I also have to buy some meat as I have miscounted the number of days I need food for. Kelly went and bought some shoes as she only has thongs and her feet are freezing. We go to the Empire Hotel which is opposite the train station. 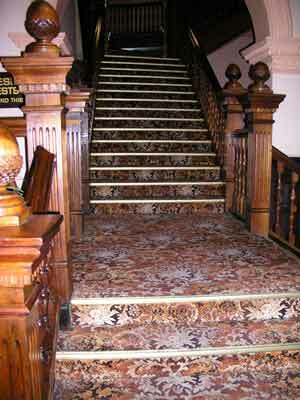 Here we have a beer and admire the beautiful staircase. 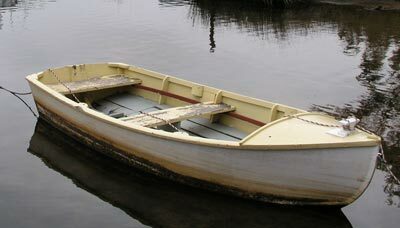 This was made in England from Tasmanian timber. The whole hotel is amazing, well worth looking at from the inside. The buses arrive and we head off just after 3:15 pm. It is a very windy road back to Strahan and we get there at 4:00 pm. Today has been a quite unique experience, far better than other tourist trains I have been on in Australia. Once back in Strahan we get in the car and go to a service station and get fuel for our stoves and a nut for the battery cradle arm. We then head back to our camp site in the state forest, arriving at 4:30 pm. Our spot is still vacant so we again set up some stuff before going to get more timber. We read and relax for the rest of the afternoon. It finally stops raining at 5 pm although it starts again at 7 pm. Like yesterday, more people arrive and set up camp. Even though there are at least 10 cars here, it is very under crowded. Dinner tonight is the lamb loin chops we purchased today. During the night, we spot a possum licking our barbecue plate.